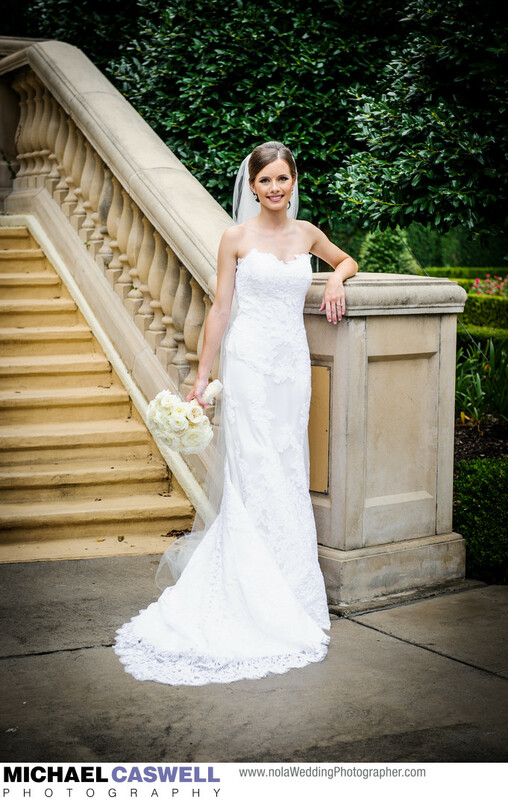 This stunningly beautiful Gulfport Mississippi bride was photographed by the large concrete staircase in front of the luxurious Beau Rivage Hotel in Biloxi just before heading to the nearby Cathedral of the Nativity of the Blessed Virgin Mary for her wedding ceremony. The reception afterward took place at the spacious and elegant Slavonian Lodge. I was proud that a collection of my images from this couple's wedding were published in Premier Bride Mississippi Magazine. A separate bridal portrait session a month or so before the wedding is a great idea if you want a wide variety of photographs of you in your dress in different settings. A bridal portrait session allows us to take our time capturing these images without the potentially stressful time pressure of the wedding day, and gives you the option of a framed enlargement to be on display at the reception. Alternatively, you can set aside some time on the wedding day itself to capture a few of these kinds of images at the hotel or the ceremony venue, as was the case with this series of images. But just be sure to allow enough padding in your planned schedule so that if the preparation phase runs long (as it often does), you still have sufficient time to capture these photographs. Location: 875 Beach Blvd Biloxi, MS 39530.